Wow, today it’s my birthday! Which means what better day for reflection. I’m the age where I’m officially, from now on, just 30+ years of age 🙂 Looking back on my 30th year it sure was a big one and will be hard to top within my lifetime. But every year of my life thus far has successfully gotten better, and I have a sneaking suspicion that even with this monster year I had while I was 30, that my 31st year is going to be even better. Why? Because I’ve been blessed to do one of the things I enjoy most in this world – travel. 1. Traveled like a local and found not everything in the world should be the way I know it to be. Participating in a Hindu wedding ceremony in Bali, Indonesia. Photo courtesy of Conor Musgrave Photography. Especially as an American, it is easy to go to a place and think “wow, they would be way better off if they did it the way we did it” – I feel like we have this tendency as Westerners to believe everything in the world should be just as we know it – the Western way. After visiting places across the world and spent the time to travel like a local, live like a local, get to know the local culture-I believe that “Western instinct” couldn’t be more wrong. The world is an incredibly wonderful and diverse place and we should celebrate that instead of turning it into what we know our lives back home to be. 2. Traced my roots back to Vietnam to find the missing pieces to who I am. 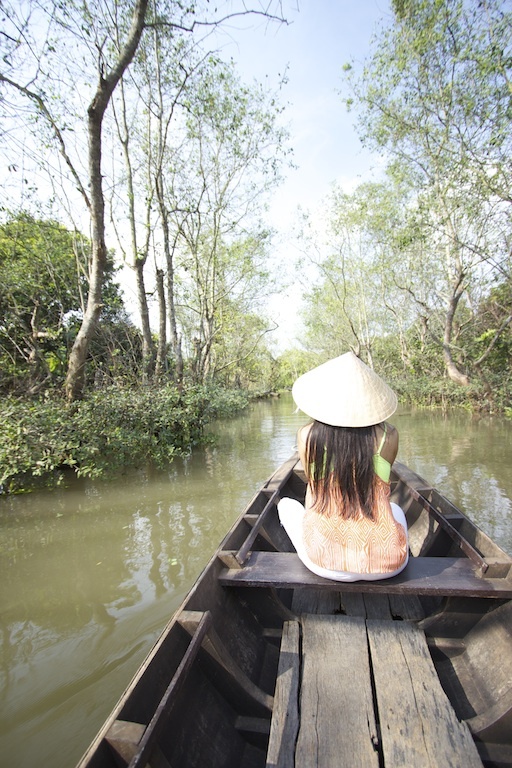 Gliding the canals of the Mekong Delta in Vietnam on the long, wooden boats. Photo courtesy of Conor Musgrave Photography. As a 2nd generation immigrant (born here but my parents were not) the saying “you don’t know where you are unless you know where you’ve been” applied to me being raised by immigrant parents. There was so much more I could understand about my upbringing and my parents once I met our whole family and made their stories come to life before my eyes to accept my whole configuration as a person. 3. Found the type of joy that makes me smile whole-heartedly. Sharing loving moments with my Auntie in Nui Thanh, Vietnam. Photo courtesy of Conor Musgrave Photography. I’m not talking about the smile you make when you pose for pictures. I’m talking about the smile that unintentionally radiates from your face to represent the resounding joy you feel throughout your entire body. This smile above expresses pure love and a happy heart. That’s the smile I’m talking about. 4. Had adventures and learned not to sweat the stuff you cannot control. Wrangling pythons in the Mekong Delta, Vietnam. Photo courtesy of Conor Musgrave Photography. Adventure is different for everyone, and for me it doesn’t start until everything has gone wrong – and you don’t need to be thousands of miles away from home to do that. Adventure has continued to teach me to be flexible, not take things personally, and to accept things that are out of my control. This 6-foot python snake wasn’t an adventure until he started licking my face for example 🙂 Adventures has by far, taught me the most valuable lessons for my day-to-day life. 5. Used technology to my relationship advantage instead of letting it become (for the most part) a relationship disadvantage. The first time I visited Vietnam, we didn’t have phones or internet in the remote areas and at that point “selfie” wasn’t even a thing. Fast forward to this day in age, and I was able to take a photo with my Ba Noi, send it to my family in real time back in the USA over text and have a conversation with them while I was with her. Technology can paralyze you – it can isolate you and damage your relationships, but it can also bring you closer and more in-tune with the world and the people you care about. So let’s do that, shall we? 6. Took the time to stop and enjoy the moments instead of rushing through a trip – and rushing through life. 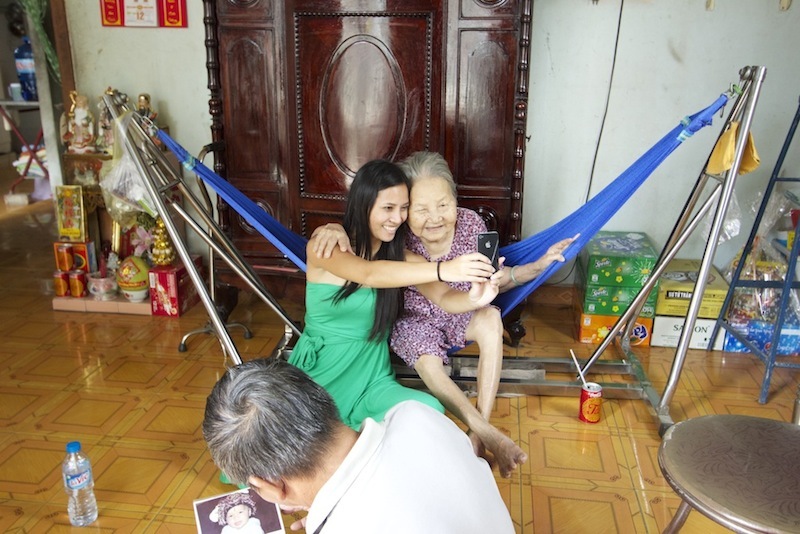 Speaking of selfies…we spend so much time now trying to take a picture of a sunset, a video of a concert – we try to document the moment for forever or rush off to fit in as much of a country as we can in the time we have. But sometimes you just have to put the camera down, look at your friends next to you and enjoy the moment. I know it’s really hard to do when you’re traveling and you have a limited time, but after this long I have finally learned to stop trying to do so much and love the life I have in that moment. 7. Was given (many) a helping hand(s), and learned the world is an incredibly kind and generous place. Getting a helping hand from my soon-to-be-husband and Kehrin Hassan of Jet Set Wed before our Filipino wedding in Boracay, Philippines. Photo courtesy of Conor Musgrave Photography. As an American, it’s so easy to stay within this bubble – care about my local news, my immediate group of friends, when in fact there is so much going on in the world, so many people to connect with and love as well. I’ve learned to broaden my horizons and consider others in a much more vast term mostly because we are all so apparently different, yet we all share the same human heart. I have been lent way more helping hands along the way than corrupt ones to learn how incredibly kind and generous the world is – so be kind and generous to it back. 8. Shared this travel journey with someone. Basking in the sun at one of the Worlds Top 10 Best Pools at the Hanging Gardens Ubud Resort – Bali, Indonesia. Photo courtesy of Conor Musgrave Photography. Travel is different when I am solo or with a fellow traveler I met along the way (or my best travel partnership yet: with the man I love and am spending the rest of my life with). There are times and certain things to do independently, but for the majority I would say life isn’t worth it unless you have someone to share it with. So by all means – I’ve learned to share this travel journey with someone and it couldn’t be more fulfilling. And the greatest lesson of all (that deserves two spots): had the courage to allow travel to change me. 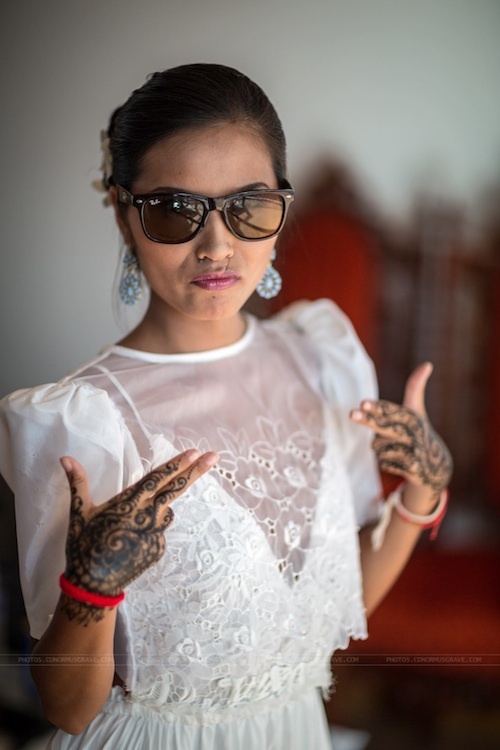 Showing off my “gansta” hands with the traditional, tribal tattoos from henna for our Filipino wedding in Boracay, Philippines. Photo courtesy of Conor Musgrave Photography. This is one of the hardest things travelers face coming home, with every trip we take – the last thing we want to do is go home and go right back to the person we used to be. It’s easy to be the ‘person you want to be’ while on the road with no distractions and every day life to get in the way. It’s hard to let travel change us permanently. I decided the difference between allowing myself to fall back into those ways and the “new me” – was courage. Going out on the road takes courage, but the real test of courage, the true test of travel: is to have the courage to let travel change you. And I don’t just mean on the road but also the real, every day you at home. The best lesson I’ve learned has allowed me to change so much over the past decade with each culture I’ve interacted with, each adventure I’ve had, every smile that came about from those moments I embraced. And all it took was the courage to take the leap to get out there and leave the confines of home, but mostly – to have the courage to let travel make me a better and more complete human being. Don’t forget to LIKE us on Facebook and FOLLOW us and our recent Northwest Travels on Instagram. And next stop! South Africa – May/June 2015. This was one of my favorite blog posts to write of all time, because of all of you in this world that I have met in my 30+ years, and what you have contributed to my life. Thank you to everyone that has made this last year especially an amazing, life changing, dreams-became-reality kind of year. A special thanks to my husband / soon-to-be-husband Branden for joining me on this travel journey and having the courage to learn these above things among other things himself along the way. And a very heartfelt thank you to my mother – the most courageous of them all that inspires me to live the way that I do, and giving me the opportunity to do so. 30 was a breathtaking year and I hope to see you all out there on the road in my 31st!